La Manior Fleuri was the location of the beautiful wedding and reception of Angela Lachney and Dusty Bernard on Saturday, June 17, 2009. 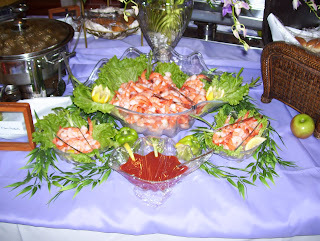 The couple had passed appetizers of sweet and sour meatballs served on pretzel sticks and boiled shrimp cocktail cups. 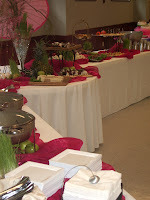 The menu was Louisiana Crawfish Etoufee with fluffy white rice, Smoked Beef Brisket, Peppered Pork Tenderloin, Boiled Shrimp, Crabmeat Augratin, Chocolate Dipped Strawberries, Crudite Cups and Fresh Fruit with Gran Marinier Dip. 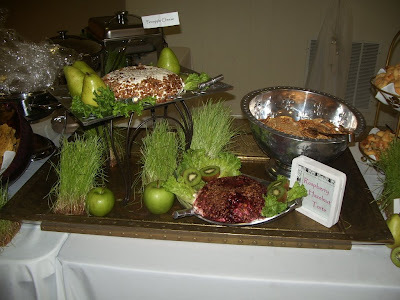 Best Catered Events wishes the newlyweds all the best and thank them for allowing us the opportunity to help create memories on their SPECIAL DAY! We utilized mirrored cubes for a fresh look. Beautiful foyer at Coughlin Sanders Auditorium in beautiful Alexandria, LA. 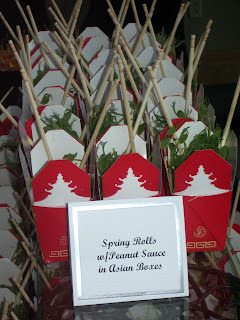 Reverse "U" table set up allowed the 250+ guests to go down both sides of the tables for faster service Spring Rolls by Chef Shane Smith and presented in red Asian boxes, hand delivered to Best Catered Events by Lisa Teiger and Chef Andrew Alexander Crossan of CuisineEtc, NYC. "Gran Marnier Fresh Fruit Tinis"
LSUA Health Sciences Department held it's graduation on Saturday, June 27, 2009 at the Coughlin Sanders Auditorium in beautiful downtown Alexandria, LA. The facility is absolutely beautiful with windows all around and very modern touches. 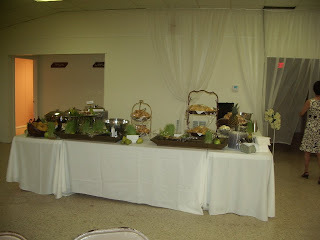 Although not caterer friendly, we were able to provide a lovely set up of fresh food and service to the 250+ attendees. The menu included Louisiana Crawfish Stuffed Jumbo Mushrooms, Crabmeat Mornay, Louisiana Crawfish Dip in Phyllo Shells, Spring Rolls in Asian Boxes, Minis Dessert Station, Rivers of dark and white chocolate with dippers, Sun Dried Tomato and Feta Torte, our own handmade sweet and sour meatballs, ham and asparagus roll ups, cheesey jalapeno bites, homemade chicken salad w/walnuts on buttery croissants and our own Summer Punch. 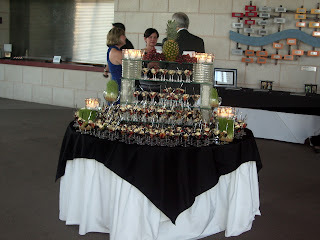 Upon entering the foyer, guests were greeted by our "Gran Marnier Fresh Fruit Tinis" and an open bar. All in all, this was a great event. 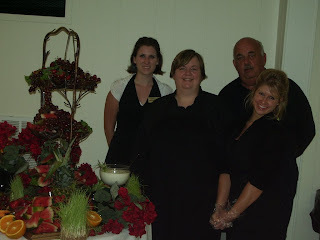 Best Catered Events wishes to thank Chef Shane Smith, Floor Captains Wendy Chapman, Jenna Mohler and Jenny Dunkley as well as Shawna our newest team member for their hard work and extra effort put forth to make this event so great! 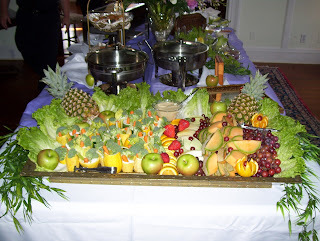 Best Catered Events....for catering that is always...........OUT OF SIGHT! 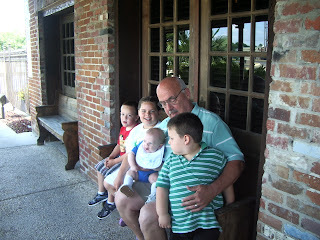 The family gathered at Don's Seafood House in Baton Rouge for lunch on Father's Day. Dustin had to work, but his mom Sharon came in his place. 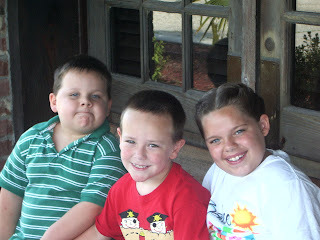 The food was great, and we all enjoyed our visit. 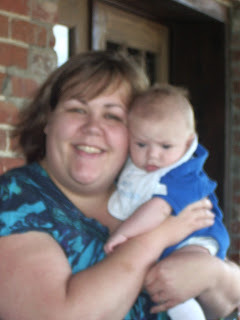 Baby Evans is so much fun! His personality is definitely coming out. Hard to believe he is 3 months already. Papaw Rick had a nice time, and loves his new blower! 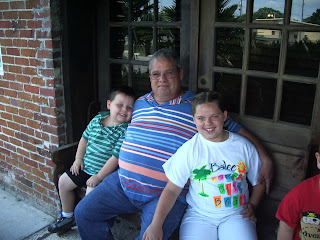 Hot, that is what it is in CENLA! 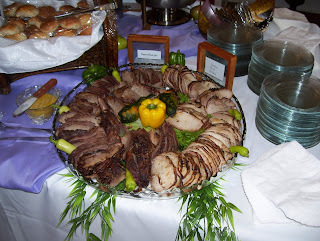 Best Catered Events is booking and cooking for all kinds of events in and around CENLA, Shreveport, Natchitoches, Tioga, Alexandria, Bunkie, Moreauville, Plaucheville, Cottonport, Hessmer and all little communities in the area. We are barbecuing, smoking fresh meats, churning homemade ice cream and making fresh banana pudding. We are still doing drop off meals for Pokeno groups as well as Lion Club banquets and family reunions and get togethers. This weekend we will be providing food and staffing services for LSUA School of Medical Sciences Graduation to be held at the beautiful Coughlin Sanders Auditorium in Alexandria, LA. 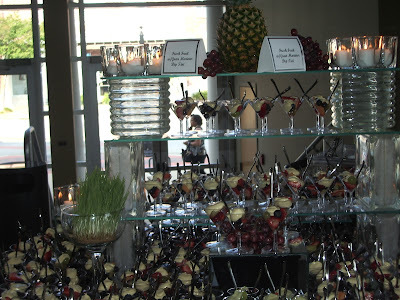 We are expecting 250+ and are doing passed martini glass appetizers, and that famous river of white and dark chocolate as well as 14 other choices for the guests. All in all, Summer is off to a great start. 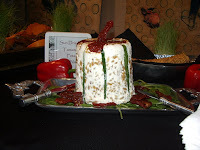 We are busy working with our 2010 brides on their menus and event dates and start times. Looks like love is in the air, and there will be lots of weddings in 2010 for sure! 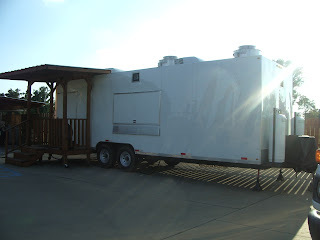 With an eye out ahead, we are beginning our preparations to ready the mobile kitchen and have it readied on quick notice should the need arise to provide meals during a hurricane, or other disaster. 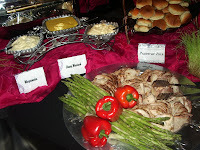 Best Catered Events, out in the community, and always creating catering that is OUT OF SIGHT!!! 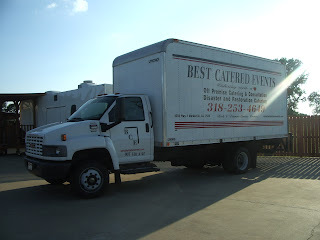 Have a safe July 4th.......from Best Catered Events. 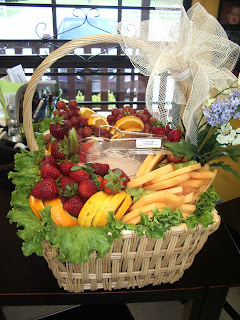 This week has been so busy with all the catering for the drug reps and their clients. We have catered at Dr. Brouilette's Clinic, Thompson Home Health, Hessmer Nursing Home, Colonial Nursing Home and Bayou Chateau Nursing Home in Simmesporte, LA. All of these clients enjoyed a nice meal and our new customers have all been so pleased. 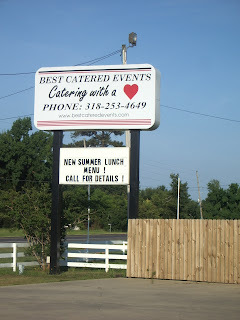 Remember Best Catered Events when you need catering for any event! 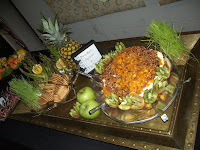 Best Catered Events was hired to cater the VIP tent in Alexandria, LA for the White Linen Night and Art Show by the owner of ExacTax and ExacPhones. The temperature was in the 90's and the mood was festive. 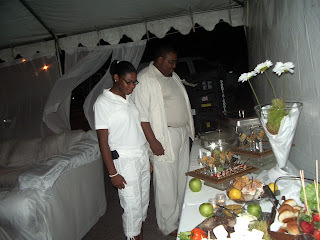 The tent was the party place for 20 of Mr. H. Isadore's guests. The tent was air conditioned and featured a white sofa and chair, bistro tables, and white balloons with twinkling white lights inside. There was a white chandelier hanging from the center of the tent. 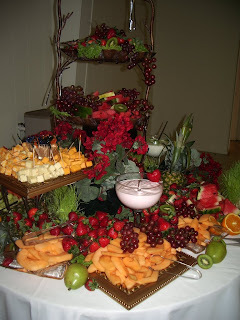 Best Catered Events provided food and service as well as a white chocolate river. Large marshmallows and huge strawberries were enjoyed all evening. We also provided our "Voodoo" Display in mini martini glasses. 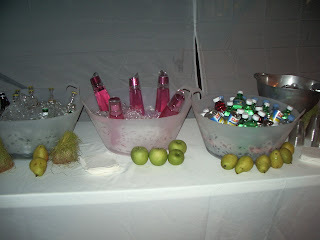 Specialty beers, flavored waters, and Nuevo Sparkling Liquer were provided and the guests really enjoyed those. 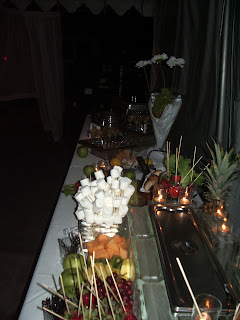 The Nuevo was light pink and with the battery operated white lights inside the ice cubes, the look was awesome! Specialty cigars were on hand for the cigar smokers, along with a "cutter". We finished up around 2 am, but the event was great......Live bands and a DJ, Jazz, Reggae and contemporary music, good food and plenty of wonderful liquor selections certainly made for a nice event. 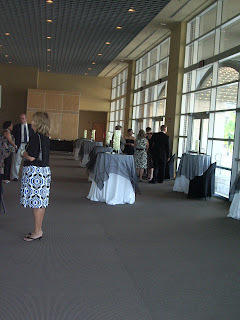 Rhiannon and Jeff Abshire celebrated their wedding with a reception at the Plaucheville Community Center on Saturday, May 30, 2009. The 200+ guests danced, drank and ate while visiting with family and friends. Everyone had a wonderful time and sent the happy couple off with lots of best wishes. The newlyweds will reside in Kaplan. Best Catered Events wishes the happy couple all the best. 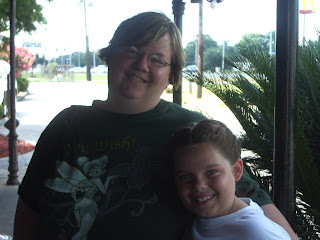 Rhiannon was the very first bride that booked a wedding reception with Best Catered Events in June of 2008! Community Healthworx had a fabulous fundraiser on Thursday, May 28, 2009 at the River Oaks Square Art Center in Alexandria, LA. Guests were welcomed out front under a tent with glasses of wine and passed appetizers. 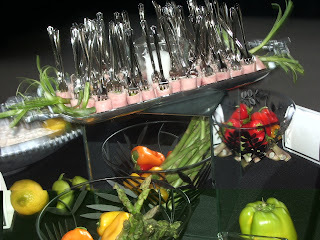 Jena and Sara passed some ham and asparagus roll ups, mini crawfish pies and our famous "Voodoo" in mini martini glasses on gold mirrored trays. 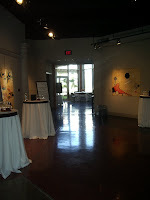 Upon entering the complex the guests made their way to each of six tables of specialty wines and 2 food areas. 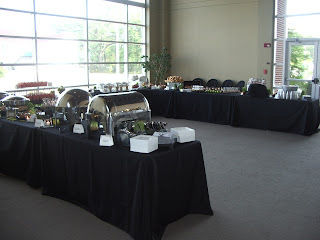 There was a cheese station, and the other table featured chicken cordon bleu, spinach, shrimp and artichoke dip, bacon date wraps, chicken salad croissants, mini muffelettos, peppered pork loin with rolls. 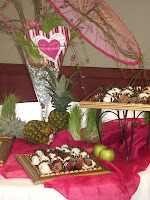 The specialty dessert station featured gourmet chocolate dipped strawberries, lemon bars, cookies, and assorted chocolate bar cookies. The 250+ guests ate and enjoyed the wine for a worthy cause. Best Catered Events, out in the community and always ready to go that extra mile to provide good, fresh food with a smile! It wasn't raining, but we had our umbrella anyway! 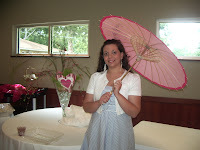 Hollie had a wonderful turnout for her shower at Christ The King. The ladies came and went for the 2 hour event and all the gifts went home in 4 or 5 vehicles, so much stuff. 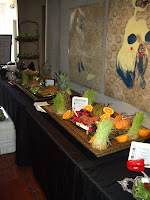 We used pink and white with wheatgrass and lots of minis for her food table. She loved the look and her menu, she really loves my meatballs. Hollie got so many nice gifts and loved her shower. The afternoon was over almost as quickly as it began. We really wish Hollie and Andre' all the best in their new life together! They are a fun couple and a joy to be around.